If you’ve ever taken a look at the contemporary art world and thought to yourself, “There sure seems to be a dearth of space-tourist paintings,” you’re in luck. 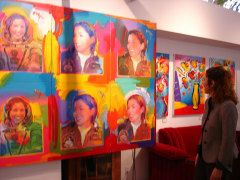 Last week at his New York City studio, Peter Max, the American Pop artist whose style influenced the Beatles’s iconic Yellow Submarine film, unveiled his latest project: 16 DayGlo portraits of Anousheh Ansari. Ansari made headlines last month when an eight-day stint at the International Space Station earned her the title of first female space tourist (additionally: the first Iranian, the first Muslim woman, the first to blog about it, the first to shoot homemade videos and post them online… you get the idea). Hello, This is a facsinating Blog...as a prospective undertaker this is just the sort of insight I require! One question has me wondering: there is a bit of folklore I hear is that claims the dead are generally buried without shoes...is this true?